I hope this post finds you enjoying this rare February 29th. In honor of this entirely arbitrary calendrical anomaly, in which we stick on an extra day to our short month every 4 years, I have decided to have some fun with it and create a ritual. However random this day may be, it is a rarity in our day-t0-day life, so I have decided to drink a rare and special beer for the occasion. But that’s not all folks, since I’m going to be drinking a beer that I have 2 bottles of, I will revisit this scenario again in 2016 (supposing the world is still around) with the same beer to see how it has developed over the years. Though I am selecting a specific day to commemorate a future imbibing, this can be a fun way for you to create future events with your special or rare beers. If you have recently had a child, gotten married, or perhaps started a course of study that you will graduate from, these are all events that you can celebrate years into the future. As long as you follow some simple aging guidelines (refer to my barley wine post) it is quite simple to preserve your beer (if you can keep yourself from drinking it) to enjoy in the future for a really special occasion. It really makes the moment that much more unique when you have prepared for it years in advance. Also, be sure to select an appropriate beer for aging, generally a high alcohol (9-10% or higher) beer, and preferably bottle conditioned (meaning that there are living yeast still in the bottle, this will appear as sediment on the bottom of the bottle). If you can, it is ideal to get 2 bottles of the beer so that you can drink one fresh before you set the other one aside for your future celebration. Pouring from the 750ml bottle into a snifter style glass, the beer shone a bright reddish bronze with a fairly thin white head that did not linger long. I am getting quite accustomed to the aromas and flavors imparted by this particular brand of bourbon barrel aging. As with the Central Waters bourbon barrel aged stout and barley wine, the Lift Bridge ‘Commander’ was aged in Heaven Hill bourbon barrels. I have yet to try some of the bourbon from Heaven Hill, but it is surely on my list as it does wonderful things for beer. The aroma was pungently rich with butterscotch, caramel, earthy vanilla and a touch of bourbon. After warming a bit more and rolling around the glass, subtle vinous notes became present along with some cocoa and candied dark fruit. The alcohol was minimally present in the aroma, especially considering the high ABV. The flavors were quite consistent with the aromas with robust caramel and vanilla up front. There was a more present earthy/musty oak character in the flavor that complimented some of the sweetness from the malt and cardamom. Along with some light berry flavors, the alcohol was more noticeable in the mouth as an enjoyable warmth on the finish and lingering aftertaste. The mouth feel was quite soft and dense, slightly viscous but not overly coating of the tongue and mouth. Everything I was hoping to taste in this beer was there along with many subtleties that I was not expecting. This beer has developed very nicely in the 3 months it has spent sitting in the bottle and it will be quite an act of restraint to hold off opening the other one for 4 years. I think this beer will be one that people will look back on a year or more in the future and wish that they had tried some or at least been a part of the first release (this is me hoping they brew this one again). I could see this beer attracting a following on par with Surly ‘Darkness’ with regard to the quality of the beer and limited availability. 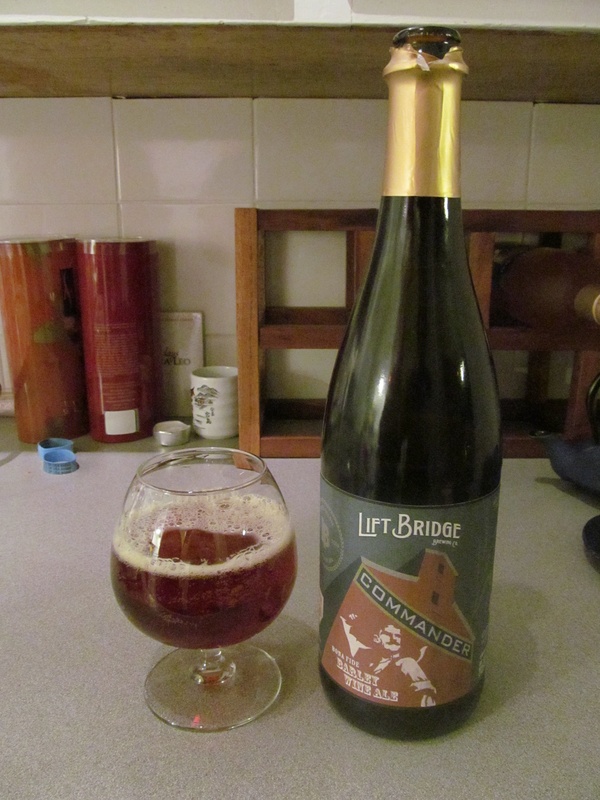 I have been a big fan of Lift Bridge since the first time I encountered their beers, and I must say that they really knocked it out of the park with their first big bottle, limited release beer. One other positive note with regard to Lift Bridge is that, although their beers have not been available on liquor store shelves since this past summer (they had lost their bottling contract with Cold Spring Brewery) they have returned to store shelves around the metro area and will be hosting a tasting tomorrow evening at The Four Firkins. It should be a good time, as it usually is with the Lift Bridge guys, and it is exciting to see yet another high quality local brewery be available (once again) to the liquor store crowd. This was a great evening and a fun experiment in creating a bit of a time capsule for myself. I encourage you to find a reason to stash some beer away and create your own fun future party. Hope to see you again in 4 years to revisit the ‘Commander’. Until then, keep enjoying great beer. Posted in Special Posts and tagged Commander Barley Wine, Heaven Hill Bourbon, Lift Bridge Brewery. Bookmark the permalink.